1 kb DNA Ladder is suitable for sizing linear double-stranded DNA fragments from 250 bp to 10 kb. The ladder consists of 13 bands that are generated from PCR and restriction enzyme digestion of double stranded DNA. What is the difference between GelRed® and GelGreen®? Which one should I choose? The main difference between GelRed® and GelGreen® is their fluorescence excitation and emission wavelengths. GelRed® has red fluorescence, similar to ethidium bromide. GelGreen® has green fluorescence, similar to SYBR® Green or SYBR® Safe. Both dyes are compatible with standard UV transilluminators. GelGreen® is also compatible with blue light transilluminators, which allow users to avoid exposing themselves and their DNA samples to ultraviolet radiation. GelRed® and GelGreen® have higher sensitivity for double stranded nucleic acids compared to single stranded nucleic acids, but GelRed® is more sensitive for staining single stranded nucleic acids than GelGreen®. GelRed® is about twice as sensitive for double stranded nucleic acids compared to single-stranded nucleic acids, and about five times more sensitive than GelGreen® for staining single stranded nucleic acids. For more information about these products, please visit our DNA stains technology page. Why do you offer GelRed® and GelGreen® in DMSO or water? The water formulation is a newer and improved product compared to the stock in DMSO. We recommend using dyes in water to avoid the potential hazards of handling DMSO, which can be absorbed through the skin. We continue to offer dyes in DMSO because some users do not wish to alter their established laboratory protocols. Based on internal testing, both formulations perform similarly. What instruments can be used to detect GelRed® and GelGreen®? GelRed® is compatible with a standard UV transilluminator (302 or 312 nm). GelGreen® has sufficient absorption between 250-300 nm and a strong absorption peak at around 500 nm. GelGreen® is compatible with a 254 nm UV transilluminator or a gel reader with visible light excitation such as a Dark Reader or a 488 nm laser gel scanner. Share this product with a colleague or purchasing manager. Tax is assessed in the state of California. All fees will be calculated during checkout based on your shipping information and are subject to change. SPECIAL - Order 5 or more and receive 10% off. 1 kb DNA Ladder is suitable for sizing linear double-stranded DNA fragments from 250 bp to 10 kb. The ladder consists of 13 bands that are generated from PCR and restriction enzyme digestion of double stranded DNA. The 1 kb and 3 kb bands contain more DNA to provide internal orientation. View more information about our DNA Stains technology. Ready-to-Use Ladders are provided pre-diluted in 1X loading buffer at a concentration of 20 ng/uL. A separate vial of 6X loading buffer is provided to add to your DNA samples. The loading buffer provided contains density agents and two blue electrophoresis tracking dyes that run at approximately 1.5 kb and 200 bp in a 1% agarose gel. GelRed® is an ultra sensitive, extremely stable and environmentally safe fluorescent nucleic acid dye designed to replace the highly toxic ethidium bromide (EB) for staining dsDNA, ssDNA or RNA in agarose gels or polyacrylamide gels. GelRed® is far more sensitive than EB without requiring a destaining step. GelGreen® is a sensitive, stable and environmentally safe green fluorescent nucleic acid dye designed to stain either dsDNA, ssDNA or RNA in agarose gels. GelGreen® is far more sensitive than SYBR Safe. 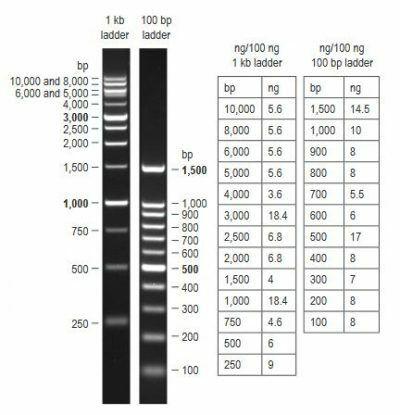 100 bp DNA Ladder is suitable for sizing linear double-stranded DNA fragments from 100 bp to 1500 bp. The 500 bp and 1,500 bp bands contain more DNA to provide internal orientation. The Gel-Bright™ LED Gel Illuminator is a non-UV lightbox for detection of fluorescently labeled nucleic acids and protein. 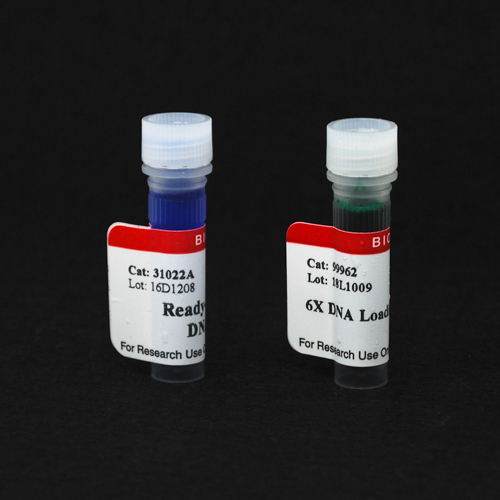 DNAzure® Blue Nucleic Acid Gel Stain is an ultrasensitive reagent for visible staining of dsDNA in agarose or polyacrylamide gels. Activated charcoal retains ethidium bromide, GelRed® and GelGreen® efficiently in a convenient bag for decontamination of used gel staining solutions. Each bag has a total capacity of at least 10 mg ethidium bromide. All payment in US dollars must be payable on a US bank.